Back of the Cereal Box: Where's Maddy? 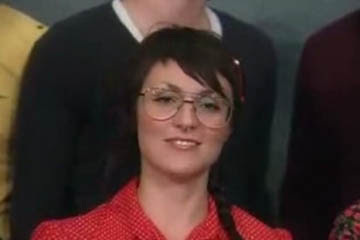 After having shown the video for "Collection of Stamps" — which is apparently the name of the song and not the name of the band, which is I'm From Barcelona, strangely — to anyone with a spare three minutes, I've noticed that one girl — the one I've named Nosering Girl — looks a lot like a hipsterfied Maddy Ferguson. I swear, it's not just me coming off the Twin Peaks kick. Had I been able to find any big enough images of Maddy wearing her Sally Jesse Raphael glasses, the resemblance would be even more striking, believe me. 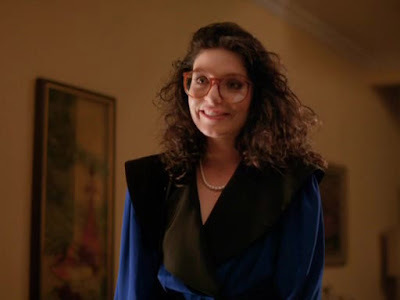 EDIT: I found a good image of the bespectacled Maddy, on a German Twin Peaks wiki site, of all places.